Have you ever heard of TEEP ? May be not, but you must have heard about Tony O. Elumelu, C.O.N. He is a visionary entrepreneur and philanthropist. Mr. Elemelu has been responsible for creating businesses across the continent, in sectors critical to Africa’s economic development. His foundation recently launched a flagship entrepreneurship programme called The Tony Elumelu Foundation Entrepreneurship Programme (TEEP). TEEP is a $100 million programme, which will create and grow 10,000 African entrepreneurs with business ideas that can transform Africa over the next decade. These new African entrepreneurs will go on to create 1 million jobs and $10 billion in revenue, boosting African economy. TEEP aims to create an enabling environment for entrepreneurship in Africa to thrive. TEEP will support African start-ups to build a firm foundation for their businesses through mentorship, learning as well as networking. That way, when TEEP give funds, start-ups will be able to use the tools they have learned to put it to better use and maximise the benefits for their business. TEEP is a great opportunity for Africans to achieve their entrepreneurship dreams. 15 things you should know about TEEP. As you continue to read, note that the deadline for the first set of applications is 01 Mar 2015…Apply now without delay. TEEP programme is open to all legal residents of any 54 African countries and the proposed business must operate in Africa. If you have an original business idea or an early stage company (0 to 3 years old), then TEEP can help you to achieve your dreams, provided you are ready. You must be 18 years and not considered a minor in your country of residence. Your business must be located in Africa and should not be a research institution, faith based organisation, value adding trading company or government contractor. All applications must be submitted ONLINE and through the TEEP APPLICATION PORTAL only. TEEP have 1,000 places available annually, why not apply now before the first deadline of 01-Mar-2015 midnight. 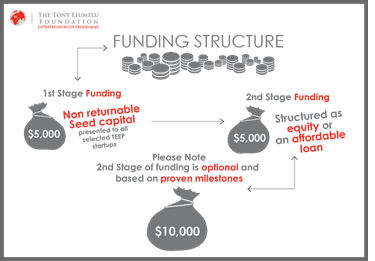 There is no application fee associated with applying or selection for the programme that would be demanded by The Tony Elumelu Foundation, Staff, Nomination Committee or Mentors. If you are offered a place in the programme, you will expected to provide some Identification and financial documents such as valid ID, reference, previous bank statements etc. For transparency and fairness, the Foundation has nominated a Selection Committee from various parts of Africa and they work with clearly defined selection criteria. What are the criteria? The TEEP Mentors are highly experienced professionals, business frontrunners and entrepreneurs with vast knowledge and excellence in their fields, who want to help the next generation of African entrepreneurs. If you are an experienced professional who want to join the mentors, read more on the TEEP mentor page. Successful completion of the 12-week Start-up Enterprise Toolkit. The Toolkit will provide free training that will be directly relevant to helping you improve your knowledge and practical business skills. This will equip you with the basic skills required to launch and run your business. Elumelu Entrepreneurship Forum – Your start-up will be showcase to a global audience of entrepreneurs, incubators, governments, investors etc. As a member of the TEEP Alumni Network, you will have continued access to the TEEP Portal. This gives you full access to their online resource library, peer to peer engagement, online and offline events notification and continued affiliation with TEEP. This foundation is ready to support, because all travel to Lagos and expenses incurred during participation in the Boot-Camp and Elumelu Entrepreneurship Forum will be covered by the Foundation. No reimbursement is possible for dependent’s costs. If you need VISA, the foundation will provide endorsement letter and refund the visa cost upon receipt. From now on, your problem is not lack of money to start business but rather lack of feasible idea or even your inaction. TEEP is willing to give $5,000 to pursue your dream. If you are carrying a business idea and you do not have funds to start. Simply go on the website and click ‘APPLY NOW’ to get started. 2 Comments on "Tony Elumelu Foundation Entrepreneurship Programme TEEP"
Maruf – It is true and real. Mr. Elumelu presently serves as a member of the USAID’s Private Capital Group for Africa Partners Forum. He received the Leadership Award in Business and Philanthropy from the Africa-America Institute Awards. He was also named African Business Icon at the 2013 African Business Awards.